Although these two species can look similar from a distance, they are normally easily distinguished by the stem, leaf and phyllary hairs, with B. brachyphylla being short hairy, and B. sergiloides being glabrous. This in fact is the usual key to distinguish them. In addition, the leaves of B. brachyphylla are almost always present in abundance, linear, and just 1 to 2 mm wide; whereas the leaves of B. sergiloides are often completely missing, and, when present, obovate and 5 to 15 mm wide. Hence I never thought I'd have trouble telling these two species apart - until Fred Melgert and Carla Hoegen came across plants of Baccharis brachyphylla that had the wide leaves of B. sergiloides, but still with the lance-linear shape of B. brachyphylla; and in short order Birgit Knorr came across plants with wide leaves that appeared to be glabrous and with the shape of leaves of B. sergiloides! The purpose of this page is to show how to distinguish such difficult plants from a larger set of traits that distinguish them. Fig. 1. 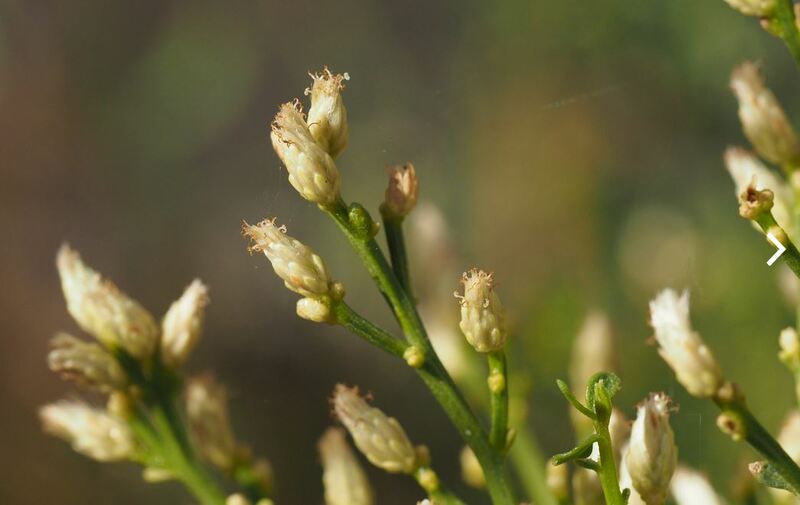 The inflorescence of normal plants of Baccharis brachyphylla on the left and B. sergiloides on the right, not to the same scale. Click on the pictures for larger versions. The upper stems, leaves and phyllaries of B. brachyphylla are short hairy. The entire plant of B. sergiloides is glabrous. The inflorescence branches of B. brachyphylla have leaves (bracts), hence the name brachyphylla for the short leaves in the inflorescence. The inflorescence of B. sergiloides has no leaves at all. 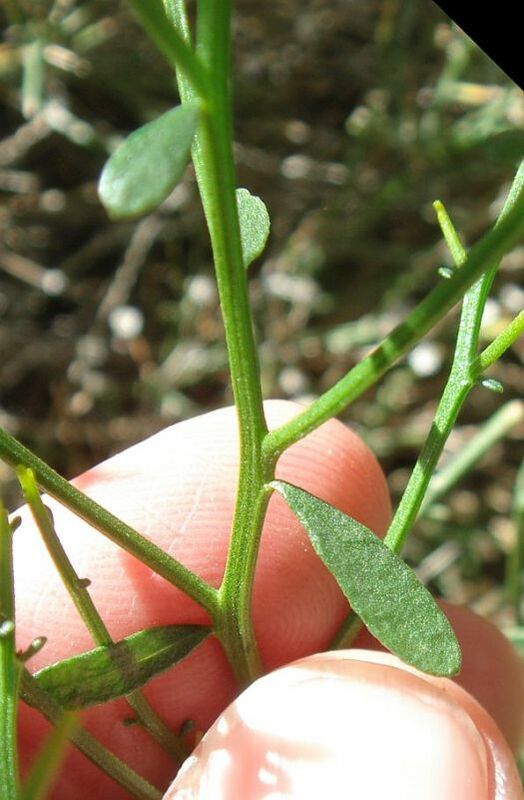 The phyllaries of B. brachyphylla are very similar to the leaves, long and narrow, with the outer phyllaries almost as long as the inner ones, with just two series of phyllaries. The phyllaries of B. sergiloides are not leaf-like at all, with short outermost phyllaries and four series of phyllaries. The phyllaries of B. brachyphylla have slender tips, whereas the phyllaries of B. sergiloides are blunter at the tip. Fig. 2 shows the difference in the stems and leaves below the inflorescence. Fig. 2. 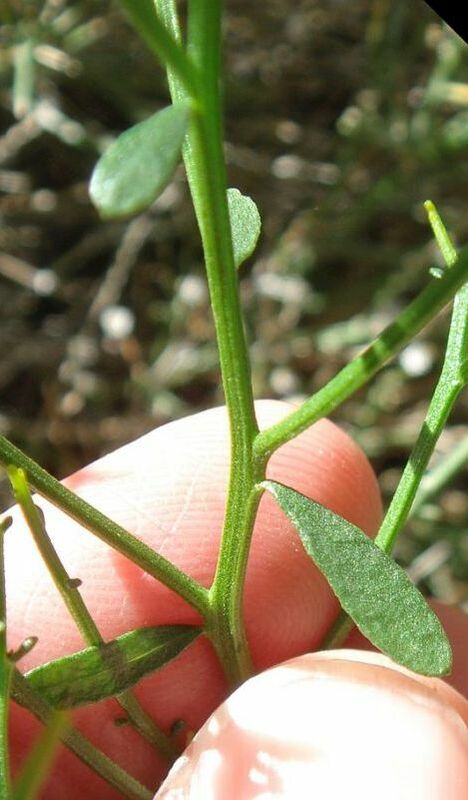 The stems and leaves below the inflorescence of normal plants of Baccharis brachyphylla on the left and B. sergiloides on the right, both to roughly the same scale. Click on the pictures for larger versions. The leaves are much wider for B. sergiloides, and there are many fewer of them. In fact, very often the entire plant is leafless. The stem is narrower and more striate (ridged) for B. brachyphylla. Although the stem of B. sergiloides is not as straight as the stem of B. brachyphylla in this photograph, other photographs show a straighter stem, so that may not be a significant difference. It therefore seems to be a piece of cake to distinguish these, right? Well, most of the time that is true. But not always! The first difficult plant was found by Fred Melgert and Carla Hoegen on 30 November 2018, growing in a narrow canyon in heavy shade; see their extensive pictures at iNaturalist. They took a large number of photographs precisely because this plant seem confusing. This plant was pretty clearly B. brachyphylla from the hairy stems and leaves, the leafy stem, the bracted inflorescence, the slender striate straight stem, and the leaf-like long phyllaries. But it had some leaves that were very much wider than any leaf on B. brachyphylla was supposed to have. 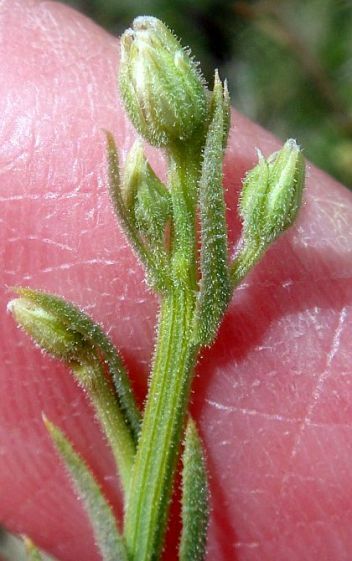 The floras give its leaves as being 1 to 2 mm wide, which is roughly the width of the upper stems. 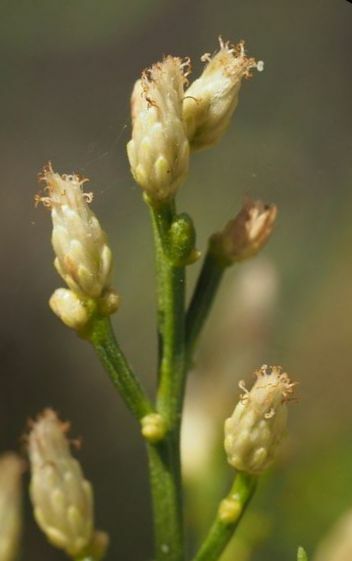 Many leaves on Fred and Carla's plant appeared to be two to three times the width of the stem, about 4 to 6 mm wide, with one leaf in the inflorescence possibly even wider. But their picture also shows some normal narrow leaves of about the stem width, and the shape of the wide leaves was still the lance-linear of B. brachyphylla, so the most likely explanation for the wider leaves is simply that they were growing in deep shade. Such anomalously-larger leaves in heavy shade are in fact seen fairly often in many species. An even more-anomalous plant was found by Birgit Knorr; see her pictures at iNaturalist. Her plant was not obviously-hairy in her pictures, except for a very young shoot which had some leaves with short hairs. Her plant also had some very wide leaves, with one of them appearing to be the obovate leaf of B. sergiloides. But it did have the slender straight stems of B. brachyphylla, with a bracted inflorescence and the phyllaries of B. brachyphylla. This plant seemed so anomalous that I, along with Fred and Carla and Birgit, paid a visit to Birgit's plant, and studied the other Baccharis plants nearby. We found that Birgit's plant was indeed short-hairy; the hairs just were not very apparent in the original pix. Furthermore, many of the leaves on Birgit's plant, and the two plants growing with it, were the oblong leaves of B. brachyphylla. And only a very few leaves on Birgit's plant were obovate; the rest were the typical linear / oblong leaves of B. brachyphylla. Birgit's plant was growing in a fairly shady area, and the widest leaves were found in the deeper shade of the middle of the plant. So once again the most likely explanation for the wider leaves is simply that they were growing in deep shade. Here are pictures of Birgit's plant, and the two plants growing on either side of it, the one to the northeast and the one to the southwest. There were a total of about 15 B. brachyphylla plants in Birgit's canyon, and many of those in more sunny locations were dead-typical B. brachyphylla in all respects. Here's one that is about 550 feet to the northeast, and another that is about 2500 feet to the southeast. I do have photographs of B. brachyphylla growing in deep shade that still look exactly like normal B. brachyphylla. One possible reason for the difference between these normal plants in shade, and Fred and Carla's plant and Birgit's plant, is that the latter two plants received significant rainfall in October. They therefore grew rapidly in warm conditions, with the sun at a higher angle in the sky, which may have resulted in the larger leaves. Copyright © 2019 by Tom Chester.